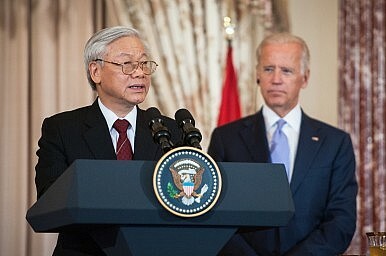 General Secretary Nguyen Phu Trong, seen here with U.S. Vice President Joe Biden during a visit to the United States last year. Who Is Vietnam’s New President? Tran Dai Quang has been sworn in, marking Vietnam’s latest high-level political change. On April 2, the Vietnamese National Assembly swore in ex-public security minister and police general Tran Dai Quang as president. In the swearing-in ceremony, Quang pledged absolute loyalty to the party, state, and the people. An overwhelming majority in the national assembly – 436-29 to be exact – voted Quang in. Quang was the only candidate put forward in January by the Communist Party of Vietnam during its Congress held once every five years. In January, the Communist Party had re-elected Nguyen Phu Trong, 71, general secretary, granting him a second term. Trong’s re-election came after reformist prime minister Nguyen Tan Dung withdrew his candidacy, making way for deputy prime minister Nguyen Xuan Phuc to take on his position. Vietnam has no paramount ruler and is officially led by a triumvirate of president, prime minister, and general secretary (Communist Party chief). Experts have said that the presidency is more ceremonial than other posts. Decisions are reached collectively and in secret by a 19-member politburo, of which all three top leaders are part. Quang, 59, was a deputy in the 13th National assembly and holds a law professorship. He was previously the director of the Security Consultation Department before taking on the post of minister of public security. He was also member of the politburo of the 11th Party Central Committee. Le Hong Hiep, a visiting fellow at Singapore’s ISEAS-Yusof Ishak Institute, opines that the presidency may be just a stepping-stone as Quang seeks to rise further in the party, helped by his clout in the security apparatus. At home, Quang’s internal security background makes him favored by party leaders. The appointment of a security figure, some say, could signal that the party remains resistant to political reform even as it undertakes structural economic reform. Abroad, Quang’s ministry of public security has also been a focus of criticism of Vietnam’s human rights record. Yet as some experts have argued, on foreign policy, Vietnam is expected to largely stick to its policy of multi-polar balancing – diversification and multilateralization of relations between various major powers beyond just the United States and China – rather than definitively shift towards a single country. A key test for the country’s foreign relations will be when Quang receives U.S. president Barack Obama in May when he makes his first visit to Vietnam. The visit was announced after Obama met with Vietnamese Prime Minister Nguyen Tan Dung on the sidelines of a summit at the Sunnylands retreat with leaders of the 10 Southeast Asian countries. Fishery Disaster Tests Mettle of Vietnam's New Government Interview: Vietnam's 'Other' Political PartyVietnam Should Abandon Non-Alignment NowWhy Vietnam's Foreign Policy Won't Change After Its Party CongressIs Vietnam Creeping Into a Succession Crisis?